This newly painted regiment of Old Glory figures was needed to complete my 8th French "Division, each composed of 4 Line and 1 Light Infantry "Regiments". The Legere, especially in the early years, often emulated Light Cavalry dress. I have tried to paint almost all the little details of their elegant uniform... the white piping on the red collars and the blue cuffs, the red cuff flaps with pewter buttons, the piping often worn on the seam of the pants, etc. The Legere are fun to paint because of the many details of their dress that might vary from regiment to regiment, particularly for the Chasseur and Voltigeur companies. I have this regiment's Voltigeurs with red over yellow plumes, yellow epaulets with red "crescents", yellow shako cords, and chamois collars piped red. The Chasseur companies of this outfit have red over green plumes, green epaulets with red crescents, and green shako cords (and green lace on the top of the boots). This regiment was raised during the Consulate, in 1803, and it is the first that I have painted in the side plumed shakos often worn by the Legere regiment in the early years of the Empire. I have used highlighting to bring out the fringes of the Epaulets on the chasseurs and carabiniers... bright green and orange, respectively, and the same for the plumes. The flag is an old Signifer production... the flag sheet says "copyright 1992"! The puppies a week ago, at age 8 1/2 weeks. All but two have gone to their new homes now (the four boys), while the two girls will stay with us, one of them belonging to my daughter the newly minted Veterinarian, and the other to us. These guys really pop with the bright yellows, reds, and greens against the dark blue uniform. Nice! Were eagles always yellow metal for legere regiments? Thanks, Jon. I don't think the Legere used Silver eagles, as opposed to the usual gold, but I will have to check that one! Thanks for the king words! Beautiful regiment...and puppies, so cute! Love them Peter! Excellent Legere! Very nice and colourful unit! Lovely looking legere in blue, and those puppies are cuties! Thanks on both accounts, Dean! The new figures certainly ooze 'elan', and the puppies look like they approve. Yellow Labs? Thanks, Stokes. 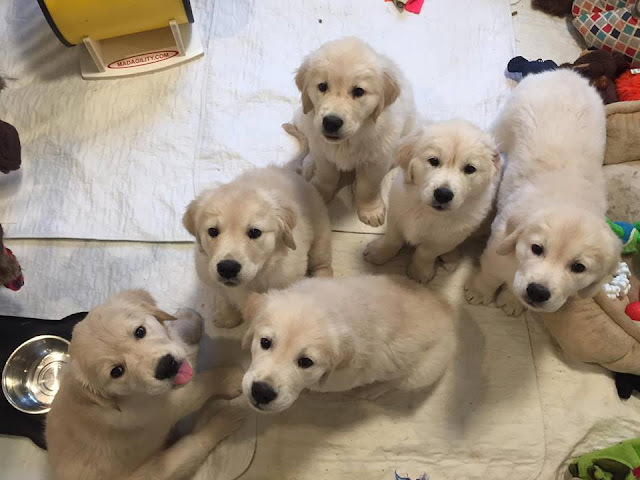 They are Golden retriever puppies. They come from a line bred to be very light, almost white. Yep, even if light infantry, these guys are "regulars". Excellent work! What pack numbers did you use for this unit? Thanks; these are Old Glory FXI-71, "Legere in Shako with side plume", with command figures drawn from FXI-67, "Legere Command"
Great work, and I imagine it would have been a nice change of pace to paint something other than brown. I can’t look at those puppies, stuck as we are still trying to domesticate a beagle. He’s coming around I have to say, but I very much miss our old golden retriever. Thanks, Laurence. My older daughter and her family have 2 beagles, and they're good, but I do prefer our Goldens! Lovely looking lights! Much more dashing than their line comrades! Thanks, Iain; I am sure they would agree with you re: their Ligne confreres! Fine Legeres and Chiens to boot. Thanks, Jake. We are now down to just the two pups we kept!